At yesterday’s New York Overwatch event, in a rented-out space in midtown Manhattan, Overwatch game director Jeff Kaplan stood in front of a slide showcasing an old Egyptian woman, an autistic Indian woman, a bodybuilding Russian woman, a plump Chinese woman and a Mexican hacker woman. “One thing that we did with the game that was very important to us was to challenge stereotypes,” Kaplan said. “If you look across modern shooters in 2017. . . to think that we have a mother who’s Egyptian. . . that’s not a common thread that you’re gonna see,” he explained proudly. Overwatch’s dedication to inclusivity is remarkable. How galvanizing—a shooter inside a bright utopia populated by heroes of all races, genders, religions, ages and sizes. Overwatch’s world is swollen with a sort of color-blind optimism, asserting that possibility transcends demographic. Iraq is envisioned as a sleek scientific hub in the Oasis map; the game’s bright-eyed poster girl dates a woman. I’d fly a blimp back and forth across the United States with the banner, “Overwatch is doing it right.” Because it is. Overwatch’s world is where everybody belongs. If you believe that more diverse gaming casts appeal to more consumers, that would help explain why Overwatch has attracted 30 millions players across the globe. Even after the game’s release, Overwatch’s design team has done all the right things to prove its dedication to inclusivity, like adding three badass, stereotype-defying ladies—the sniper-mom Ana, the Mexican computer wiz Sombra and the West-African robot Orisa—in lieu of another chiseled white man. But inclusivity doesn’t just mean that the game is for “everybody.” It also means it is for “everybody with a credit card.” Designing a crew of heroes anybody can envision themselves joining is a great way to make anyone feel at home in a game, and also, a very effective marketing strategy. This apparent contradiction raises the question: Why assert that inclusivity is not a political design decision—especially when there’s such a large and vocal faction of gamers who argue that politics has no place in games? Is it possible to cater to everybody? Yes, calling something “political” is divisive. It shouldn’t be, and especially if you’re calling something what it is. In my view, politics means something beyond political parties and governmental goings-on. It’s a mode of talking about basic rights, wellbeing included, that are tied to demographic and social realities—government is just how we organize that. Inclusivity is a political value. It asserts that all humans are equal and shouldn’t be discriminated against because of who they are. It also means that anybody can be a hero, another Overwatch tagline. “The only people that we want to exclude from our game is people who exclude other people,” Kaplan said. Kaplan made a distinction between his team’s intentions as designers and how fans interpret his game. It’s true that players have taken ideas from Overwatch into the political sphere. In South Korea, D.va, Overwatch’s pro gamer girl hero, has become a rallying symbol for women’s equality. The National D.va Association president said in a Kotaku story that her group is fighting for a world in which “we don’t have to listen to swear words or sexually harassing statements nearly every time we play games.” D.va is inherently aspirational. Today, a 16-year-old girl earning the #1 rank in competitive StarCraft does not feel impossible, but it does feel a little fantastical. And, like Kaplan mentioned, during the U.S. presidential election, a billboard advertising TrumpIsNotATeamPlayer.com had Donald Trump playing an Overwatch hero notorious for attracting less team-oriented players. 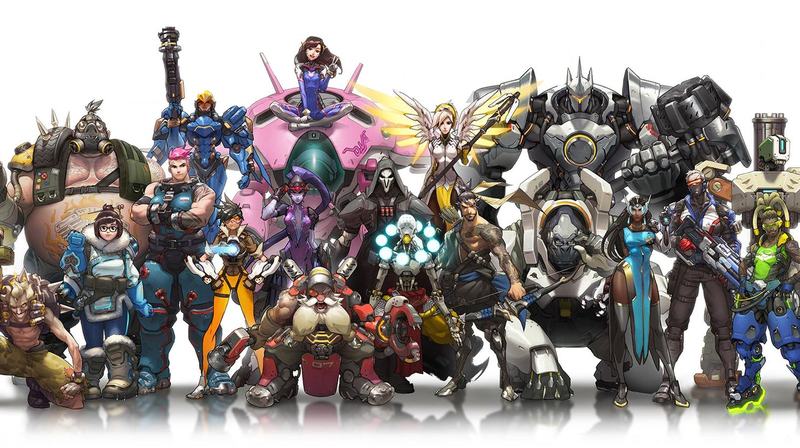 Overwatch’s tagline is that its world is “A future worth fighting for.” That tagline was originally from Project Titan, Blizzard’s failed MMORPG from which Overwatch sprung, and was carried on from 2013 through 2016, when Overwatch was released. Clearly, the Overwatch team believes in that message—or its selling power. Overwatch is a shooter, yes, but as everything from Plato’s Republic to Brave New World has told us, it is difficult to design a fictional utopia—and its utopian heroes—without commenting on what’s wrong with the present. That’s political.